understand how they function and how to get the most from them. Most serious trollers have come to the conclusion that a line counter style trolling reel is the only practical way to monitor lead lengths or “feet back” numbers while trolling. The problem comes in when anglers expect their mechanical driven reels to perform “feet back” miracles! Simply stated, a mechanical line counter reel is only as accurate as the angler who owns it and uses it properly. Trolling style line counter reels are gear driven devices that in the hands of a skilled fishermen can convert trolling from a pursuit of blind faith into literally a “fish harvesting” system. Getting the most from line counter reels starts with understanding how they function. Mechanical line counters feature a digital counter that click away numbers as line is played off the reel. These clicks or numbers on the counter are intended to represent real feet in terms of the amount of line played out. That’s the idea, but a lot of variables can have a line counter reel telling a story that isn’t completely accurate. The first issue is associated with the type of line that is used on the reel. All the major brands of these trolling reels calibrate their line counter functions using a particular diameter of fishing line. Depending on the size of the reel, the line diameter used in calibration could be 14, 17 or even 20 pound test monofilament. Using a line diameter on a reel other than that which the reel was calibrated for causes the line counter mechanism to misrepresent the actual amount of line that is being played off the reel. The reason for this misrepresentation is simple, but the solution isn’t quite as easy to grasp or correct. Here’s why line diameter makes a difference in how a line counter reel displays “feet back” numbers. Say, for example, a rather thin diameter line is spooled onto a trolling reel calibrated at the factory for use with a larger diameter line. Each rotation of the spool as line is spooled onto the reel is actually putting a little more line on the reel than the factory calibration setting indicates. Because the reel actually has more line on it than the calibration would suggest, when line is played off the reel the counter numbers or “feet back” suggestion on the line counter is going to read a higher number than the actual amount of line played out. Confusing? You bet it is and most anglers have no clue how inaccurate line counter reels actually are unless each and every reel is loaded with a line diameter that matches the reel’s factory calibration. The question is how much variance are we talking here? When just 40 feet of line (according to the line counter) is played off the reel, the variance from the actual amount of line out is only about a foot or two. In reality this minor variance makes little or no difference in practical trolling applications. That’s the good news. The bad news is the more line that is played off the reel, the more pronounced this discrepancy becomes. At a measured 150 feet out, the reel’s “feet back” estimates according to the line counter are going to be 20 to 30 feet greater than the actual amount of line that was played off the reel! In other words, an angler who looks at the counter and thinks he has 180 feet of line out may in reality only be fishing 150 feet behind the boat! Discrepancies like this are enough to impact significantly on trolling success causing anglers to either be fishing above or below their target depths depending on the diameter of the line they are fishing. You can prove this dirty little secret to yourself in the back yard by measuring off a set distance and then testing your line counter reels against this known distance. Experiment with different line diameters loaded onto your reels and you’ll become amazed at how complex this subject quickly becomes. Unfortunately most trollers just go about their business blissfully thinking the line counter reels have it all figured out! The truth is line counter reels are tools that used properly provide accurate and valuable information to trollers. When used without consideration to details like line diameter, line counter reels lose much of their value. or the record, loading a reel with line diameter that is thinner or thicker than it was calibrated for is one of the common mistakes most trollers make when getting their reels ready for fishing. If any thought is given to line it’s what break strength is best suited to the type of fishing at hand. Almost no one thinks about matching up line diameters to those a line counter reel is calibrated at the factory to use. Currently there is no industry standard for calibrating respective sizes of line counter reels on specific line diameters. Different manufacturers do it differently and this is precisely why it’s so common for line counter reels of all brands and models to be generating “feet back” numbers that are not exactly accurate or even consistent. Most anglers don’t give this idiosyncrasy a second thought and go about the business of setting lines, never realizing a mechanical line counter reel has limitations to what information it can communicate. for the advantages of line counter trolling reels. To get the most from a line counter reel requires the owner to match up reel brands, sizes and line diameters on every reel. This however is not enough to insure the “feet back” numbers are as accurate as possible. It’s also important to load the same amount of line onto each and every reel. Loading each reel with the same amount of line is easy to do because the same line counter function that displays “feet back” is also registering how much line is being put on the reel. Simply zero out the line counter, tie the line onto the spool and start reeling until the reel is full to capacity. On most line counter reels there will be a red line on the spool to indicate a full spool. If your reels don’t have this red line, fill the spools to within 1/8 inch of capacity. When putting line on the reel make note on the counter as to how many feet of line the reel accepts. Once one reel is loaded, repeat the same process over and over again with all your reels and each will calibrate “feet back” numbers consistently with one another. If you have a collection of different brand and size reels, it is possible to calibrate the reels so they all read the same “feet back” numbers. Accomplishing this will require a little more work than simply loading the reels to capacity, but this is where the process starts. Put the same diameter line on each and every reel and fill the respective reels to capacity. Thread the line through the rod guides and line up all the rods and reels on a table pointing the same direction. Now, zero out the counter device on each and every reel and then go to the rod tip and grab the line from each rod. Walk away slowly until you’re a measured distance from the rod tips. A distance of 100 feet is a good representation of a common lead length. In theory all the reels should read the same “feet back” number on the line counter because the exact amount of line was pulled off each reel. In reality every one of the reels will post a different number. 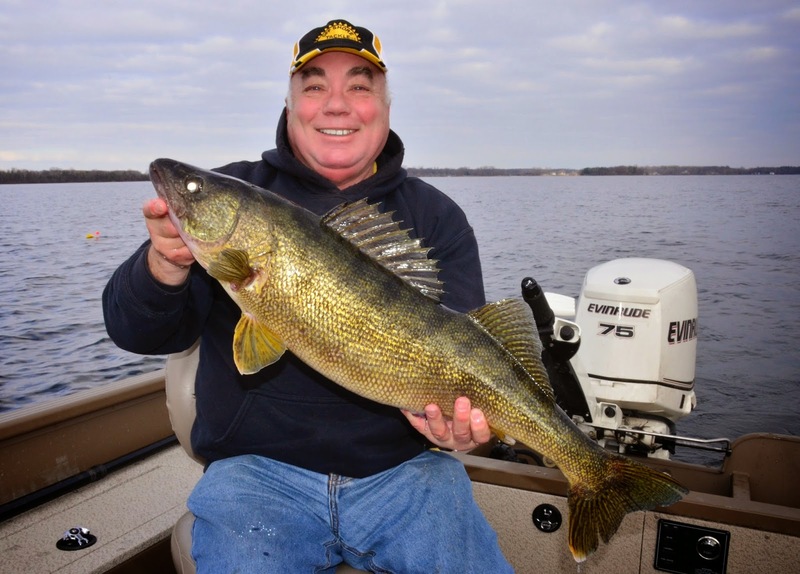 Line counter reels used for walleye fishing typically over estimate lead lengths or, in other words, the counter will say 105 when actually only 100 feet of line was played out. 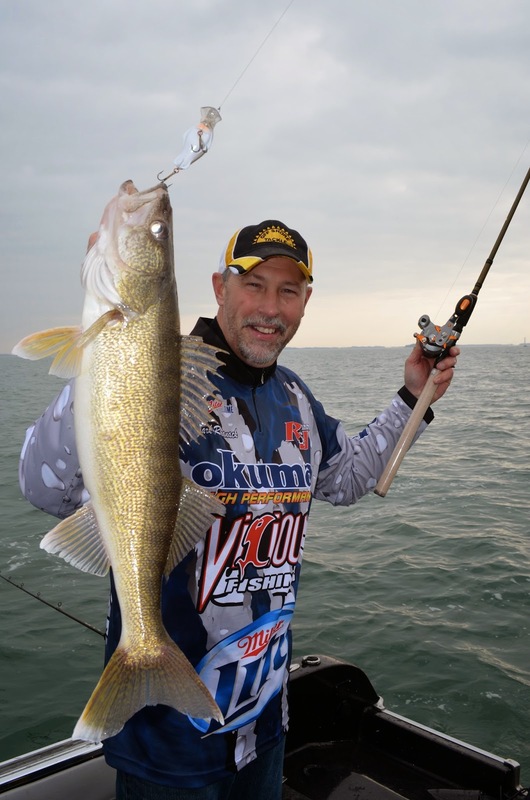 This deviation occurs because the line diameter used by most walleye anglers is thinner in diameter than the line diameter used to calibrate reels at the factory. This issue can be corrected by simply removing a little line from the reel spool and then repeating the same simple test. Every 20-30 feet of line removed from the reel will cause the counter to lose 1 to 2 feet on the “feet back” reading. It’s best to go slow and take off a little line at a time so as not to remove too much line and under calibrate the reel in the process. By cutting away a little line and repeating this simple experiment, all the reels will soon be calibrated so 100 clicks on the “feet back” reading will actually be 100 feet of line played out. As just described it is possible to calibrate each and every line counter reel on the boat to all read the same “feet back” numbers. It takes time to accomplish this and after fishing with the reels for awhile naturally line is going to have to be removed for retying or if lures get snagged. At that point the reels must be calibrated again to match up. Fishing with mismatched line counter reels is something to be avoided. It’s a much easier option to simply invest in reels that are all the same size and brand. These days with auction sites like E-Bay so common, it’s easy to sell used reels and use the money to reinvest in buying new ones that all match. For the angler who just isn’t willing to invest in line counter reels, there are other options for monitoring lead lengths while trolling. On level-wind style reels it’s surprisingly accurate to watch as the line plays off the reel spool and simply count the passes as the level-wind goes back and forth. Each pass is equal to about the same amount of line and by counting passes and duplicating the most successful passes, a rather crude but accurate method of monitoring lead lengths can be achieved. process accurate and much easier to monitor. It’s also possible, but not as practical to mark fishing line using a permanent marker. By simply playing out line against a measuring tape and marking the line every 10 feet or so, it’s possible to create metered fishing line that can also be used to monitor lead lengths accurately. Some years ago a number of manufacturers produced metered fishing line before line counter reels became mainstream in the trolling business. These days you’ll be making your own home brew metered fishing line if you’re not willing to fork out the bucks for line counter reels. The truth about mechanical line counter reels is they can be accurate when used correctly. When a line counter reel is loaded with a diameter of fishing line larger or smaller than the factory calibration the numbers aren’t going to jive. 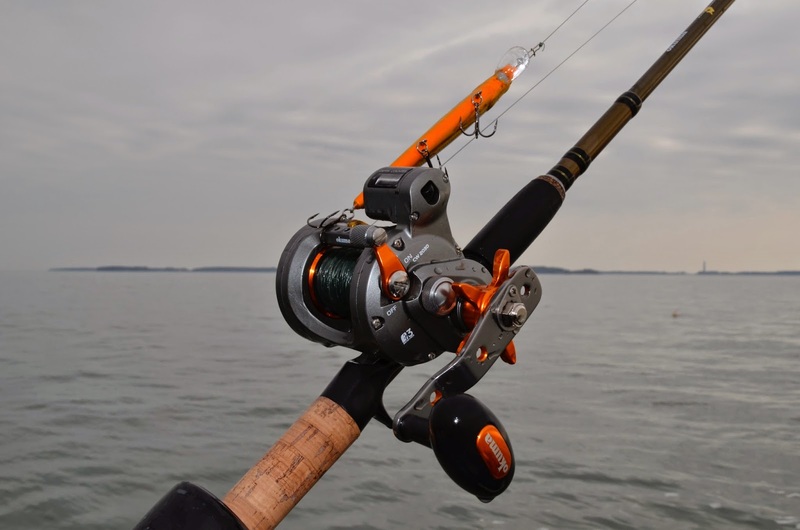 Fishing one reel with the spool full and another half empty is also a common problem that prevents line counter reels from functioning as designed. Serious trolling requires line counter reels and serious anglers must learn how to calibrate their respective reels so every reel is speaking the same language. Taking this critical step is often the difference between catching fish or blindly going fishing.